Cemeteries are known for telling the stories of the people buried there. But the symbols on headstones and monuments can tell a different story: how our view of death has changed over time. “Historic cemeteries really function as outdoor museums,” says Steve Estroff, education manager at Green-Wood Cemetery in Brooklyn, New York. A skull with wings, an urn or a tree were popular on headstones in America during the 17th and 18th centuries. The Puritans “looked upon death as something that caused anxiety because they believed in the idea of predestination – that God has already chosen ahead of time who is going to be saved and who is going to be damned,” says Joy Giguere, chair of membership and development of the Association of Gravestone Studies. “When you look at the older monuments and symbols you do get a greater sense of community,” Giguere said. “Individuals are part of a whole earlier in America. In a given cemetery, most of the people buried there adhere to same belief powers, same social hierarchical structure." But attitudes toward religion and death softened in the mid-19th century – and gravestones began to reflect that change. Sentimental symbols of death – doves, crosses, angels, flowers and hands, to name a few – started to appear. In the early 20th century, a transition from large monuments to relatively small headstones uniform in style began to appear. World War I “was a very traumatic experience for Americans, and it made Americans start to rethink the whole idea of our attitude toward death and this is the point we start to see cemeteries be unified,” Giguere said. Today, how people remember the death of loved ones can be as individualized as the person. Laser-etched photographs of the person or their pet can be placed on headstones. Images of activities the person enjoyed – like tennis, reading or NASCAR – are displayed on markers. Some families chose to plant a bush or tree instead. Outside of cemeteries, drivers place “In Loving Memory Of” bumper stickers on their cars. And others will opt for a tattoo to honor someone. To know about headstone in detail, this is a too attractive writing. Who is the author of the poem you posted? I've been researching my ancestors since I was 25 (47 years ago), and it's always a great satisfaction to find a tombstone of, e.g., a great-gr-gr-gr-grandma who died in 1855 in Texas, or a Revolutionary War or Civil War stone for an ancestor, etc. Although I'm opting for cremation, I will have a military headstone (am a retired vet) put next to one of my ancestors simply so descendants can find me! P.S. My car won't drive by an historical cemetery without turning in and at least driving through! Author unknown. Bet we could talk for hours about the stories we learn researching our ancestors. I have one going back to 1600. How piece of history at a New Jersey library. Funerals are for the living, not the dead. There is no God and if there was a heaven it would be hell. Supposedly, humans are the chosen ones by God. Only humans go to heaven. I wouldn't want to go where there aren't any trees, grass, plants, birds, bees, dogs or cats. Cemetaries are ruining our ground water and causing illnesses the government won't admit. If you want to bury your dead, do so with out all the chemicals. Allow the dead to fertilize the ground and nurish the plants and trees. When my 44 year old brother died from cancer a few years ago, his widow purchased a nice stone and had a baseball and a cardinal engraved on it. This was because my sister in law was not a christian and so she did not put any Christian symbols on the stone, but instead put the baseball and bird on it as he had been an avid St. Louis Cardinals fan all his life. We even buried a piece of the Old Busch Stadium with him. Anyway, WE know what it means. But somtime in the future will someone think he liked baseballs and was a bird watcher, too? He is buried in TN, not in St. Louis. 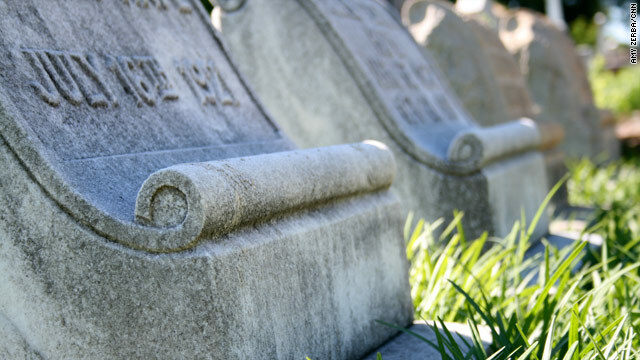 I've been looking for ancestral tombstones for 47 years, and probably would not recognize what was symbolized on your brother's stone because they are not "standard" symbols known by genealogists. Maybe your sister-in-law could get the cemetery office to make a notation in its records. However, you might not have to worry if these things are mentioned in an obituary because if a descendant is an avid genealogist, he or she will track that down. P.S. Are you descended from the Mansker's Station founder? The angel answered, "The names of those who love the Lord." "Nay, not so." replied the angel. "I pray thee then, write me as one that loves his fellow-men." And,lo! Ben Adhem's name led all the rest! donating your body to science is a great idea. helps find causes and cures for all sorts of things. just remember that most universities or whoever the body goes to does their research and when finished the family is still responsible for doing a burial, cremation or whatever their beliefs are. so it's still not free. Most of my dad's family headstones are name/birth/death fomat. Simple rememerances of loved ones passed on. Whether or not they are existent past the grave is nothing I can change. When my mother died in 2007 from an accidental fall I was heartbroken. At her funeral I cried because I missed her, but did not grieve from seeing her in a coffin. The body I saw was empty. My "mother" believed as a Christian and has gone to her reward. My siblings and I picked a nice Headstone for her. I can hear her saying " Its too expensive, don't spend so much on something I can't use." I love you Mom and will always remember you. You can't come too see me anymore but I will see you again. Lail: Don't you mean "satanism"? That's not the first time I've seen someone post about "satin worship"! Physics and all sciences do not disprove a God. However physics and science proves earth is billions of years old. Also proves systematic steps of evolution and many things religion dosnt adhere to. Science does not, cannot, is not interested in proving or disproving the existence of God. Logic and Faith are not definable on mutual terms, and such is not required. Many secular and religious scientists live entirely productive lives without conflict between the two world views. I promise that taking physics and logic classes will get the god out of you. Try studying actual facts for a while and see what happens. Creation is not only stranger than we know, it is stranger than we can know. In one of the cemetaries of New Orleans is a family mausoleum. Mr. Moriarity's wife died. He loved her dearly. So he had a mausoleum built with four female statues. Legend has it that the grieving husband said the figures represented "Faith. Hope, Charity, and Mrs.Moriarity," the four graces. Since when is Satinism a religion? Don't you mean "satanism"? This is not the first time I have seen a post about "satin worship"! The best inscription I've seen was on an urn containing a woman's ashes. It said, "I'd rather be here than in Lubbock." Yep, that pretty well sums up life on Earth. At its essence this is an overly simplistic article about religious and burial symbols. It is overly simplistic because the meaning of a symbol can be particular to the individual or collectively recognized, or both. Two hands clasping might mean "welcome to the afterlife" to viewers or family. It also might be that the person buried there was a salesperson, a politician, or well remembered and loved for their hearty handshake. Maybe they ALWAYS shook hands when greeting family... Images and carvings might be on a stone simply because the person buried there like those things, not because they have a deep religious, theoretical, or symbolic meaning. Symbolic meaning changes w/time period, culture, religion, in-groups, individuals, family members' wishes and preferences, etc. And, let us not forget that the more elaborate stones – heck, in some cases having a stone at ALL! – result from the family or estate having the money to buy one. What one puts on the stone is limited by decisions of cost versus benefit. A plain stone w/DOB-DOD and a name doesn't mean the person was atheistic, for example. However, a mausoleum does represent a certain level of cost. Memorial stones, even today, are expensive. Elaborate, custom designs even more so. For example, a pair of slant markers for two couples, with basic details and simple, standard, stock designs sandblasted into them, can cost upwards of $5,000 when license fees and burial plot footings are included. I know – I just costed them out for four of my family. The bereaved are often being fleeced because of their fragile emotional state at the time of major purchases. However, even if little Jo should have had a headstone w/a lamb doesn't mean the family can afford one.